The year is 2000 – The planets prepare for battle. 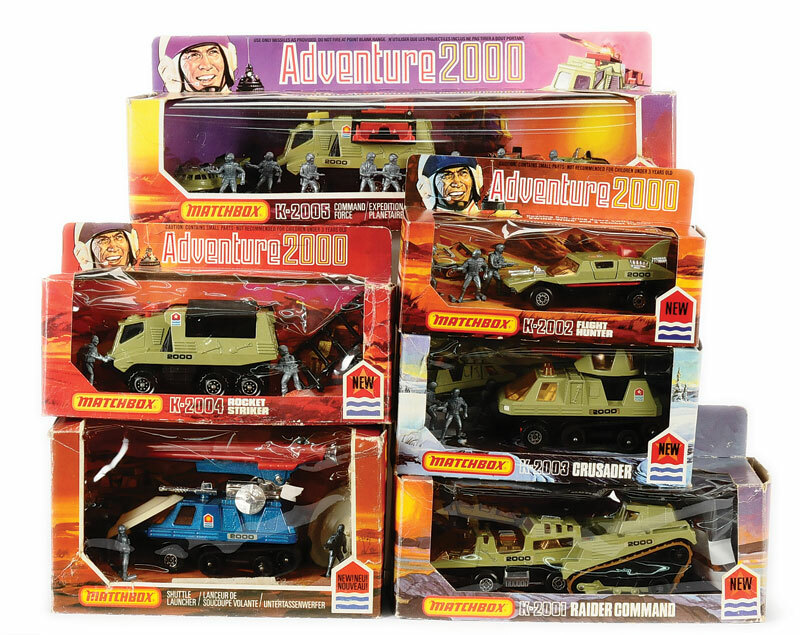 Re-enact the excitement of inter-planetary conflict with the action-packed vehicles from Adventure 2000. A new wrinkle was added in the 1979/1980 catalog—“The interplanetary commission prepares for an expedition to planet ZETO”—and all the vehicles were recast in a deep blue. The beautifully detailed line was developed and made in the UK. Matchbox was a longtime British brand, in fact—owned by Lesney Products—until the early ’80s. I found a choice 1977 ad (via combomphotos/Flickr) featuring some great art. Not sure how “Zorgon the Creepy Monster” fits in, but they can have my 75p. 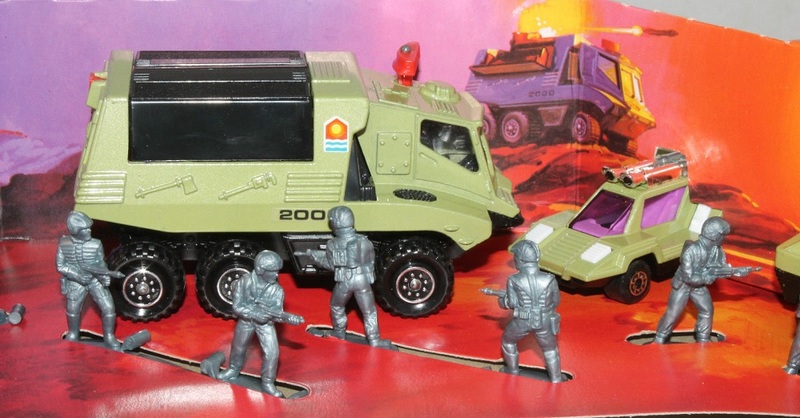 Here’s a close-up of the Command Force (K-2005) set, introduced in 1978. 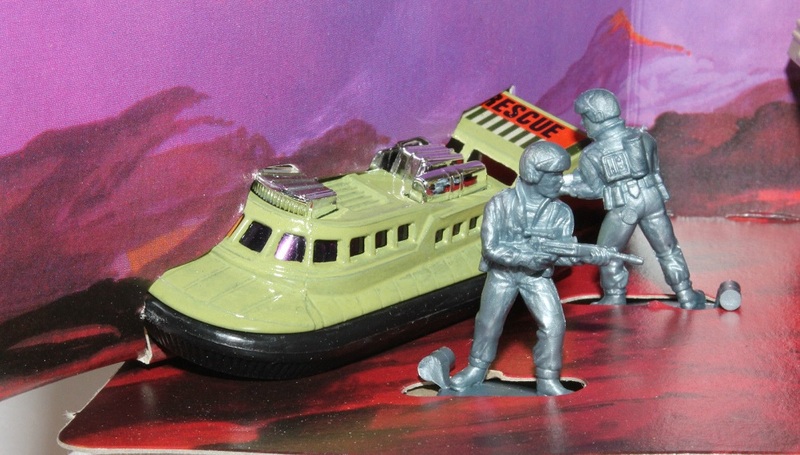 UPDATE (3/4/14): Jason at Contra Dextra Avenue discovered that the three smaller vehicles in Command Force—the Hovercraft (1972), the Planet Scout (1975), and the Cosmobile (1975)—had been previously issued. They were part of Matchbox’s Superfast line, which you can check out at Dan’s Matchbox Picture Pages. 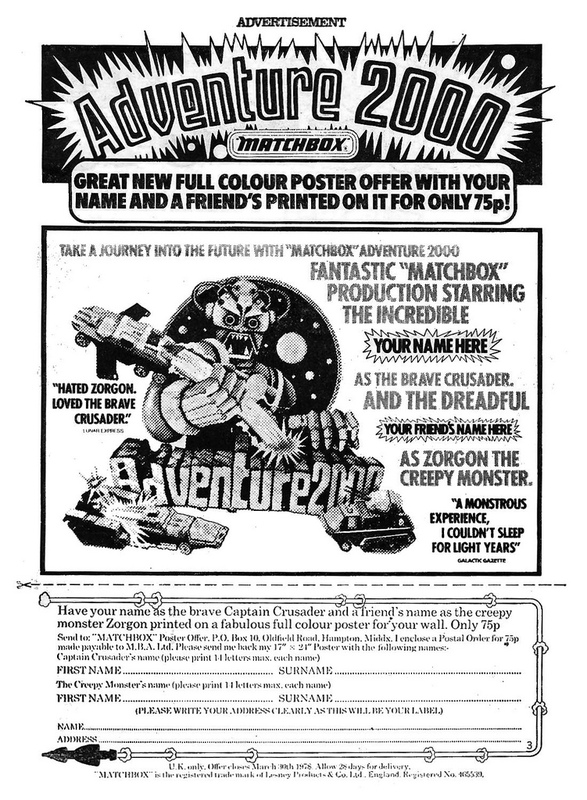 I don’t know if the latter two are Matchbox’s first produced futuristic vehicles (doubtful), but they predate the Adventure 2000 line. Wow! I had all the green series except the command truck. These were fantastic toys and I used them for everything. I had a bunch of the grey soldiers from this and other sets. I wish I could find a source for them now, they’d be great for sci-fi RPGs. People still hunt them down to use with Judge Dredd RPGs. The Raider Command vehicle was featured in a famous Dredd story called The Cursed Earth. Awesome. 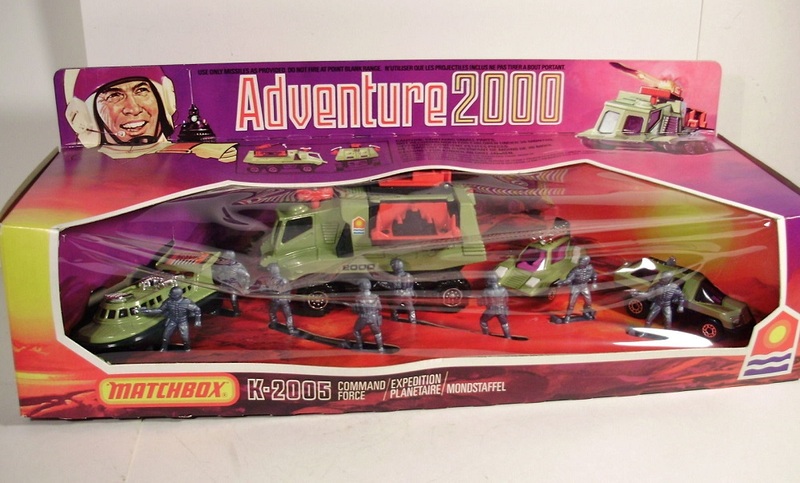 Matchbox totally ruled when it came to futuristic and military vehicles. I totally remember that K-2001 Raider Command set with that killer tracked “tank” vehicle. Definitely one of those toys I used to drool over at Fedco. I totally dug Matchbox toys for their weird orange-y windshields and windows, revealing all the shiny, detailed gold interior cabin spaces. Man, how much more ’70s can you get? I’ve fantasized about building a life-size Matchbox car using the same aesthetics, lol. Totally. We wanted to see the guts of things. I saw this and had to dig out my three vehicles from this series, which I’m posting pics of over on my blog. Interestingly enough, all three of them predate 1977. Son of a GUN. You and your collection. Earliest copyright date should be ’76, but they didn’t come out until ’77. Let me know if anything says ’75. ’72 for the Hovercraft, ’75 for the Planet Scout and Cosmobile. Oh my. I had most of these. #8 was my all-time fave. And #35. #47, the dune buggy with the dude who bounced up and down! #56. Ack. I loved these SO much growing up. I would kill to get them all now. Just beautiful toys. Among my favourite toys pre-Star Wars and Transformers. Think I played with these beauties till they fell apart! Thanks for showcasing them.